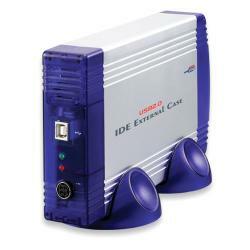 This USB 2.0 to IDE External Case allows you to upgrade 3.5" IDE disk drives to USB 2.0 ATAPI host commands. Provides the ability to upgrade and support a variety of ATA/ATAPI based disk drives without changing the peripheral hardware. Transfer rate of Hi-speed USB 2.0 interface can be up to 480 Mb/sec (max). Supports up to 127GB hard drives. Systems with OS: Win Vista / XP / 2000 / Me / 98SE and Mac 10.X.